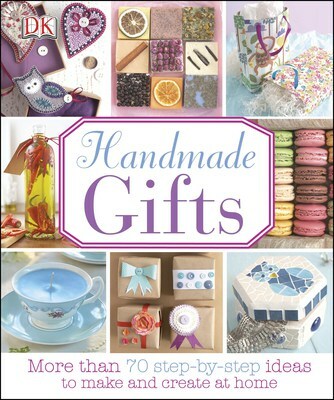 Containing more than 70 projects, from candle making and crocheting to paper-crafts and baking, Handmade Gifts is the perfect guide to making handcrafted items that people will love. Each project is clearly explained using simple step-by-step images along with photographs of the finished item and variations on how to make each piece unique. There are even ideas for green and up-cycled gifts. I’ll be starting my holiday shopping very soon and am trying to figure out what to buy everyone this year. I have the hardest time trying to decide on the perfect gift. What do you buy someone that has everything already? I was wishing I was more crafty so that I could make a nice gift. I know I love receiving handmade gifts because that person put their love and effort into its creation. My sister, Laura, is very crafty and always makes me homemade gifts. I could never part with them! This year I’m thinking of trying my hand at making a few gifts for family and friends. I recently picked up a copy of the book, Handmade Gifts by DK Publishing. It has over 70 tutorials on how to make your own handmade gifts. There’s jewelry, bags, soaps, candles, edible gifts and even gifts ideas for pets!. It’s geared towards all skill levels from beginner to advanced. I’m definitely a beginner so I was looking for the crafts that looked the most simple to make. Each tutorial has detailed step-by-step instructions with pictures so you can see exactly what you should be doing and most importantly, what it should like when you are done! You’ll find a list of all the materials and tools required for the craft. I’m looking at making a few of the crafts for myself. I’ve always wanted to make my own throw pillows and there’s a tutorial on how to make a customized pillow in the For the Home chapter. For gift ideas, I’m loving the chapter on Pampering Gifts and Edible Gifts. I’ve always wanted to make my own soap and there’s a tutorial in the book to make all natural luxury soap. The Fizzy Bath Bombs also looks pretty neat! It looks really simple to make your own flavoured oil. It shows you how to make Chili Oil, Basil Oil and Garlic & Rosemary Oil. The last chapter is on how to make Homemade Gift Bags if you wanted to really showcase your crafty talents! All the templates for each tutorial are located at the back of the book. Buy Handmade Gifts for yourself or for someone else! My sister, Laura, would enjoy reading it. Though I think I might make her something from the book and surprise her! For a limited time you can save up to 30% off on select Craft books from DK Canada! Thanks for this lovely review Stacie, we hope your sister Laura enjoyed reading Handmade Gifts too. I, unfortunately am not on the ‘crafty” side. I have two friends whom make everything as presents by themselves. I love receiving these kinds of gifts. I like a book that instructs step by step keeping an eye on the finished product. This sounds like a great book. I look forward to reading your post after you finish your craft projects, thank you for this review. I love giving hand-made gifts and foods to friends for the holidays. I see several items just on the cover alone that look promising. I’m going to definitely have to check this book out and try making some of the crafts from it. I love making gifts. This book looks like it has a wide variety in it. Thanks for sharing htis review. This sounds like a wonderful book. We Love to create awesome projects that last a lifetime! This sounds like a wonderful book. I will be adding this book to my wish list. I love making crafts with my little ones but also enjoy making crafts with a little higher difficulty level like described in this review. Thanks for the book idea! Love handmade gifts, what a great book! This sounds like an awesome book. I doing hand-made gifts for loved ones. I often make candy or cookies to give as gifts. I think handmade gifts are the best, treasure them! Great idea to make homemade gifts . There really are a lot of beautiful things one can make and I think the homemade crafts are well received by others. This is a gift that I would buy for myself. Thanks for the recommendation! Quality hand made gifts are hard to find. Thanks for sharing! Thanks for reviewing this book!! It sounds like it would be great and I wish I had seen it before Christmas but I may check it out before the next gift I do! i think this book has some great ideas from your review. i love to make crafts with my children, and especially love ideas that come with step by step tutorials and a list of materials needed! I have several books from DK Publishing, and I love them all. Thanks for introducing me to this book! I love making crafts and even more so when I am able to recycle something while crafting. This looks to be a great book full of ideas to help me make some homemade gifts with the help of the grandchildren. I love making crafts and this seems like it has some great ideas to try out! I love doing crafts, great review. I would love to do more hand made gifts if I had the time to make them. Love books like this! I’ll have to check it out! Thanks for the review! This book looks like it contains lots of cool crafts to do! I’d love to make my own flavored oil!